Abstract: The brickyard of Baden-Sooss, in the Austrian part of the Vienna Basin was selected as the stratotype of the Middle Miocene regional stage Badenian for the Central Paratethys. Stratigraphy and correlation are up-dated, and the present state of the art on fossil groups is shown. The stratotype belongs to the Upper Lagenidae Zone in a regional paleo-ecological zonation. For interregional correlation the section belongs to a part of calcareous nannoplankton Zone NN5 without Helicosphaera waltrans, to dinocyst Zone Cte, and in planktonic foraminiferal zonation by the occurrence of Orbulina suturalis to Zone M6, and to the middle part of the Langhian stage. The sediments of the so-called “Badener Tegel” are part of the Baden Formation, correlated with the Lanzhot Formation in the Czech and Slovak part of the basin. Deposition of the calcareous silty clays occurred at a water depth of around 200 m in a relatively warm, well-stratified water column. Re-deposition of fossiliferous coarser sediments from shallow regions occurs. Abstract: A 102 m long core of fine-grained sediments of the Vienna Basin (Baden Group, “Badener Tegel”) was drilled at the Badenian type locality outcrop in Baden-Sooss. An Early Badenian age (regional Upper Lagenidae Foraminiferal Zone) is indicated by biostratigraphy. The core comprises mainly bioturbated, medium to dark grey marls and shales with a slightly higher degree of tectonic deformation in the upper part of the core. XRD indicates mainly quartz, muscovite/illite, chlorite, feldspar, calcite and minor dolomite as constituents. Carbonate contents vary between 10 % and 35 % and organic carbon between 0.32 % and 0.78 %. Rare intercalations include sand layers with shell debris, a conglomerate and a smectitic tuff layer. Mean grain size ranges from 4 to 8 μm. Cyclic sedimentation was identified by rhythmic variations in carbonate and organic carbon contents and magnetic susceptibility. Rock Eval pyrolysis indicates mainly type III kerogen from terrestrial higher plant material and minor marine input. The depositional environment can be characterized as offshore, below the fair-weather wave base but within the storm-wave base. The sediments are hemipelagites, transported by pelagic suspension, that is a mixture of pelagic biogenic carbonate, mainly calcareous nannofossils and foraminiferal tests, and terrigenous clay and silt. The positive correlation of carbonate to organic carbon indicates a dilution controlled siliciclastic deposition with varying siliciclastic input. Except for minor primary laminated intervals, oxygenated bottom water conditions are reconstructed from the presence of various trace fossils and ichnofabrics from the Zoophycos ichnofacies in the deeper part with a transition to the distal Cruziana ichnofacies towards the top of the core. Abstract: A two step cluster analysis based on log-likelihood measures for categorial variables using ‘Schwarz’s Bayesian Criterion’ for grouping allows the automatic detection of ichnofabric categories from a large data set. Preferred successions of these ichnofabrics were tested by ‘Embedded Markov Chains’. This leads to the following ichnofacies interpretation: Alternating periods of higher/lower accumulation rates with higher/lower inputs of particulate food and higher/lower oxygen contents in pore waters led to sequential colonization of the substrate. The trace fossils Phycosiphon and Nereites represent opportunistic colonization of oxygenated sediments rich in particulate organic matter (POM) by deposit-feeding animals, quickly after an increased sediment input. A further stage of colonization caused by the decrease of POM induced by consumption and oxidation forced the animals to search for food on sediment surfaces and from the water column. The open burrows Thalassinoides, Chondrites, Trichichnus and Zoophycos indicate stable-bottom conditions in periods of low accumulation rates. Zoophycos, Phycosiphon, Nereites and Teichichnus suggest the Zoophycos ichnofacies for the lower section of the core; a transition to the distal part of the Cruziana ichnofacies is suggested for the upper section of the core with the appearance of Thalassinoides. The changes between stable and unstable bottom conditions significantly correlate with periods in magnetic susceptibility and calcium carbonate content, both forced by orbital cycles. Abstract: A quantitative analysis of benthic foraminifera was carried out on a scientific core from the type locality of the Paratethyan stage Badenian (Middle Miocene) and results were compared to stable isotopes (δ18O and δ13C) and magnetic susceptibility. Two approaches were applied to reconstruct the paleoenvironment. First, several indices (inbenthics %, oxyphylic %, foraminiferal numbers, diversity) and paleodepth proxies were calculated, second, multivariate statistics (Detrended Correspondence Analysis, cluster analyses combined with the indicator value method) were carried out. High correlations between environmental indices and core-depth manifest some trends. Five biofacies units were recognized, and the lowermost unit I encompasses a laminated interval coinciding with a biofacies subunit. The most indicative and abundant species is Uvigerina semiornata, a dysoxy tolerant inbenthic. The following unit II can be characterized as a stable period of improved oxygenation and lowered nutrient supply. Unit III is distinguished by Trifarina angulosa preferring well-aerated turbulent bottom water and sandy substrate, while accompanied by some low salinity tolerant species. A non-stratified water column with high terrigenous input is accepted for this unit. Unit IV is characterized by low diversities and the deep inbenthic indicator species Bulimina elongata, Fursenkoina acuta, tolerant of oxygen deficiency and benefiting from unlimited food supply in a well-stratified sea. The high foraminiferal numbers are the consequence of low terrigenous input not diluting the highly productive opportunistic species in the sediment. The indicator species of unit V, the reticulate Bolivina viennensis, has ecological needs similar to the previous unit. Environmental changes from unit IV to V are the increased terrigenous input and oscillation, indicating less stable conditions. The biofacies unit boundaries always coincide with major shifts of the isotope and susceptibility record. It is concluded, that the physical environmental parameters controlling benthic foraminiferal distribution are primarily influenced by proximity to land. Abstract: A quantitative analysis was carried out on the planktonic foraminiferal fauna from the scientific Baden-Sooss core, located at the Badenian type locality near Baden (Lower Austria). Counts were performed on groups, mainly on the generic level. Paleoenvironmental reconstruction was based on foraminiferal groups (indicator species) obtained by cluster analysis and on ordination methods. The most important faunal groups are Globorotalia, “five-chambered globigerinids” and “four-chambered globigerinids”; Globigerinoides, Globoquadrina, Globigerinella, Globigerinita, Turborotalita, Globoturborotalita and orbulinids are well represented. Detrended Correspondence Analysis resulted in three significant axes. The most explanatory first axis is high positively correlated with the groups “five-chambered globigerinids”, “cold and cold-temperate plankton” and abundance; it is thus interpreted as a temperature related factor, indicating cold shallow water masses. Cluster analysis revealed four groups, which are interpreted as clusters indicating cold water- (Cluster 3), temperate water- (Cluster 1) and warm water-faunas (Cluster 2 and partly Cluster 4). The analysis resulted in the reconstruction of sea temperature fluctuations and several cold-water ingressions into the moderately warm Badenian Sea. 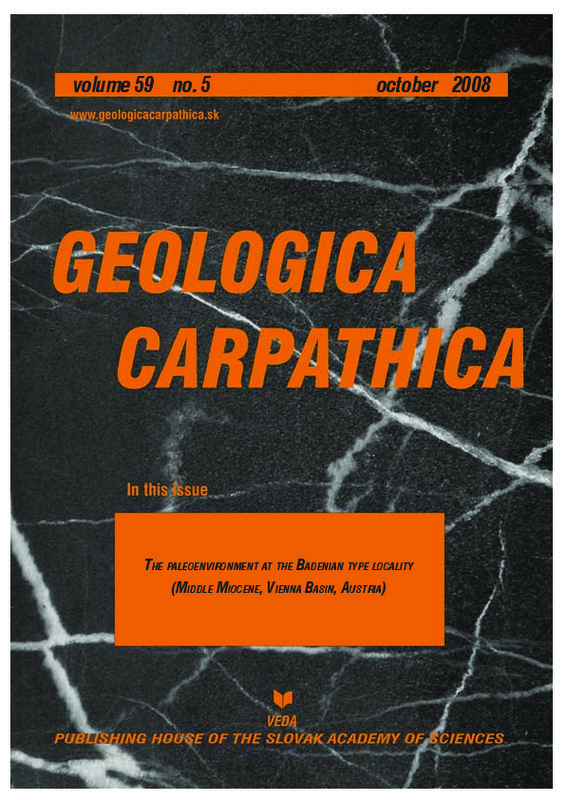 Abstract: Quantitative analyses of calcareous nannofossils were carried out on 102 Middle Miocene samples from the scientific borehole at Baden-Sooss (Vienna Basin). All the samples can be assigned to nannoplankton Zone NN5. The content of Helicosphaera walbersdorfensis allows correlation with the Mediterranean nannoplankton Subzone MNN5a. Typical near-shore forms such as small reticulofenestrids followed by Umbilicosphaera jafarii, Reticulofenestra haqii, Coccolithus pelagicus and Reticulofenestra pseudoumbilica dominate the calcareous nannoplankton assemblages. Inter-species correlations and correlations to stable isotopes and magnetic susceptibility together with multivariate statistical methods (Cluster analysis, Indicator value method, nonmetric Multidimensional Scaling) enabled the reconstruction of trends in the paleoenvironment of the upper water mass during this part of the Badenian. Low variations in abundance of ecologically sensitive species suggest relatively low fluctuating environments. The deeper part of the core (40 to 102 m) shows opposite oscillating trends (with long periods) in salinity and temperature. Around 70 m of the core the salinity maximum is combined with a temperature minimum, while a salinity minimum and temperature maximum can be found around 50 m. Trends in the upper core part are more discontinuous, possibly due to gaps in the sedimentation record caused by intensified tectonics. Generally, a linear trend towards slightly increasing salinity, eutrophication and lowered temperatures could be documented for the upper core part. Abstract: Multivariate latent structure methods were used to determine environmental factors that influenced the distribution of magnetic susceptibility, calcium carbonate, organic carbon, stable oxygen and carbon isotopes, ichnofossils, calcareous nannoplankton and benthic as well as planktonic foraminifera in the 102 m long section of late Early Badenian age (Middle Miocene, Upper Lagenidae Zone) cored at Baden-Sooss for scientific investigations. Five factors ‘temperature’, ‘eutrophication’, ‘water stratification’, ‘oxygen-rich particulate organic material’ and ‘surface productivity’ controlled the variables to different degrees. The tectonically unaffected deeper part of the section (38 m to 102 m) started with a short warm period possibly characterizing environmental conditions of the preceding Lower Lagenidae Zone. A long ‘warm’ period from 78 m to 92 m followed the first temperature decline between 92 m and 100 m. Increased terrestrial input caused by intensified weathering through seasonal changes characterized warm periods. The subsequent long ‘colder’ period between 49 m and 78 m is distinguished by increased oxygen depletion, mixed water masses and dysoxic bottom conditions preferring carbonate and organic carbon production as well as inbenthic foraminifera. The following ‘warm’ period with decreasing oxygen depletion is abruptly finished between 36 m and 38 m in the sedimentary record through tectonic deformation. In the following period, ‘colder’ water conditions dominated interrupted by short warmer intervals, finally tending to warmer water at the top of the cored interval (8 m to 16 m). Although intermediate temperatures prevailed in the youngest period, oxygen depletion remained relatively high after obtaining the maximum in the previous period. This increase in oxygen depletion toward the top of the section is reflected in rising δ13C isotope values together with decreasing temperatures, thus following — just after the Miocene ‘Monterey’ excursion — the slight global cooling trend between –14.7 and –13.9 Myr preceding the main Middle Miocene cooling period.